Michelle Renée is a principal associate and adjunct assistant professor at the Annenberg Institute for School Reform at Brown University. Denver, Los Angeles, Chicago, New York, Newark, Detroit – as some of our nation’s largest cities, these communities share many traits: urban centers, diverse communities, challenging local politics. Yet each is also unique. As varied as each city’s place on the map are the sectors, groups, and people involved in each city’s education system – teachers, school and district leaders, school designers, foundations, businesses, community organizations, researchers. Understanding school communities like these – and the people who work in them – is critical to understanding how we can best build education systems that increase life opportunities for all young people. The Time for Equity team at the Annenberg Institute for School Reform (AISR) has worked to increase that understanding by meeting with and learning from grantees of the Ford Foundation’s More and Better Learning Time initiative. This initiative aims to reinvent public schools in neighborhoods of concentrated poverty by adding and improving learning time. This approach goes beyond simply making the school day and year longer. The urban communities we work with are also reinventing how time is used both inside and outside the classroom as they seek to transform schools and communities into places where all children learn and thrive. We are both inspired and humbled by the work our partners are doing. While there is much promise and many wins in this work, it is also challenging: we are not proposing any silver bullets. Addressing the systemic inequities that have plagued our public education system for decades will require hard work and a long-term commitment to the communities and school systems being engaged. This issue of VUE aims to share both the inspiration and the challenges of this work through the stories of a cross-section of our partners in the field. Across the nation, we saw our partners using their creativity, commitment, and unique resources to create new school and system designs that challenge the what, who, and why of our public education system. Easiest to understand is the what. We learned about approaches like community schools, which surround schools in high-needs communities with a wealth of learning and support services; Generation Schools, which are reimagining the school calendar to make space for intensive learning in science, arts, and culture; and Promise Neighborhoods, which are working to create cradle-to-career pathways for young people and their families (see the sidebar for examples of more and better learning time approaches used in sites included in our study). Each approach is unique, but what links these models together is a shared commitment to ensuring equitable access for all young people to rich learning opportunities that prepare them for college, career, and civic life, particularly in the nation’s lowest-income communities. Each author in this issue of VUE writes from experience in a particular sector: education agencies, nonprofits, and advocates (McAfee, Torre, Schwarz, and Shah); community organizing groups (Perez, Madera, and Capers); funders (Lopez and Rivera); and researchers (Snellman, Silva, Putnam, Mirra, and Rogers). Yet each author also references the many other sectors they work with. Capers and Shah, for example, writing about community schools, show the connections between grassroots action, research, and implementation. Henry Perez and Perla Madera show us that though the work is led by community organizers, reform support partners, and school leaders, a much broader school community is engaged and touched by the development of two powerful high schools in East Los Angeles. Finally, working with our partners led us to the understanding that why people do this work is as important as understanding the what and the who. Common assumptions such as “to improve schools,” “to help kids,” “to fix communities,” and “to increase test scores” are superficial at best. At their worst they are vague, easily misunderstood, and laden with unquestioned assumptions. As researchers and practitioners, we pushed hard to go past the superficial to a deeper understanding of why people take a systems approach to education change. Why work across sectors and communities? Why do we think this can change educational opportunities for our nation’s young people? What do we hope will happen, and how will we know when we see it? We aimed to capture the breadth of the answers we received to these questions by developing the Time for Equity framework of twenty-four education indicators that reflect the broad range of conditions and outcomes articulated.2 The indicators include traditional academic measures such as test scores, grades, and graduation rates, but go far beyond them. They are organized into four broad categories: creating and sustaining the conditions for increasing education opportunities (e.g., school climate, community engagement); ensuring equitable access and implementation to programs and opportunities (e.g., student agency, support services); preparing students for college, career, and civic life (e.g., academic knowledge, student health); and scaling efforts up across systems and the nation (e.g., sustainable ecosystems of reform, widespread adoption). The indicators framework provides a broad picture of what could be measured or aimed for. But we also wanted to share the depth and promise of what we learned from grantees through this issue of VUE. Each author and organization included in these pages shares a deep commitment to equity – increasing the resources and opportunities provided to students in low-income communities of color. Likewise, the authors share a commitment to educational excellence. The breadth and scale of these changes vary, but all lead to engaged and deep learning. Luckily, we are not alone in these shared commitments. There are countless other organizations and stories we could have included in this edition; their exclusion is only due to limits of space. Each author was asked to answer the question “How do we know that our work is advancing educational equity?” and then to elaborate on both their answer and our question from the unique perspective of their sector and expertise. We pushed authors to go beyond the story of what they do or what they created; we asked them to share stories of impact that bring to life the data they routinely share in policy settings. This issue starts with researchers Kaisa Snellman, Jennifer Silva, and Robert Putnam, who use stories and statistics to illustrate the deep disparity in access to extracurricular learning opportunities between low-income and middle- to high-income youth – and why that matters. Amplifying this work is an article by researchers Nicole Mirra and John Rogers that demonstrates the stark differences in how existing learning time is experienced inside schools. They identify a series of time distractors and stressors that seriously impact the learning time in schools serving low-income students. Together, these two articles outline the inequity in educational opportunities that currently exist in our system – both inside and outside school. The next two articles illustrate how allies across a city can come together to publicly demand school models that expand the depth and amount of student learning time, and then to collaborate in the implementation of these models. Though the two models are different, they both engaged school and district leaders, teachers, partner organizations, and students in developing and implementing new models. Henry Perez and Perla Madera share the collaborative work that InnerCity Struggle has engaged in with numerous partners in one neighborhood, East Los Angeles, to increase learning opportunities in two high schools. Natasha Capers and Shital Shah describe similar cross-sector collaboration at the citywide level around the creation of community schools in New York City. They explain how and why teachers unions, community organizers, and other allies developed and advocated for the sustainable communities schools model locally and nationally. Key to the effort, the authors explain, is that community schools are not just about services or parent engagement but about transforming the teaching and learning that happen within schools. The systemic implementation of this work is explored by authors Michael McAfee from the Promise Neighborhood Institute at PolicyLink and Mauricio Torre from South Bay Community Services in Chula Vista, California, near San Diego, using the implementation of the Chula Vista Promise Neighborhood to illustrate the local impact of this important federal policy. Their conversation highlights the need to set clear goals for collective impact and then support sites in creating and monitoring that impact. An excerpt from Citizen Schools founding CEO Eric Schwarz’s new book lays out key requirements for effective teaching, including support, common planning time, communities of practice, and engagement with community experts. Finally, philanthropists Janet Lopez and Peter Rivera reflect on how strategic investments by funders can leverage change across a community through a discussion of their work in Denver and Los Angeles, respectively. In this thoughtful conversation, they humbly explore their privilege, responsibility, and limitations as funders of initiatives that advance equity. Together these voices, stories, and reflections remind us of the hope and urgency of working together to create more equitable education systems. They also remind us that each person working in this struggle has a responsibility to own our places of privilege and expertise, respect the expertise and efforts of others, and then humbly work together to bring about a more just society and school system. 1. For a graphic representation of this ecosystem for educational equity, see timeforequity.org/ecosystem. 2. 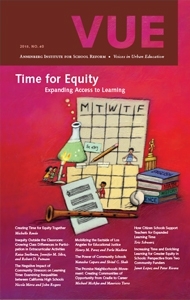 The report on the indicators, Leveraging Time for School Equity: Indicators to Measure More and Better Learning Time, and an online tool that allows users to zero in on the indicators most relevant to their work and browse additional resources, are available at timeforequity.org.